Is pricing a double-edged sword or an arrow in your quiver? Broaching the topic of pricing commonly elicits a range of reactions in a business depending on the audience. Management commonly (and correctly) recognizes price as the biggest value lever an organization can pull to improve profitability. They, therefore, love the topic, but also struggle with both defined strategy and executing the tactics necessary to optimize price performance. Other parts of the organization – including those who may be the most vocal (e.g. sales) – often talk about price with a negative connotation. Price may be seen as “getting in the way” or, potentially threatening sales revenue, or, a challenge to customer relationships, and sometimes one or more of those could be true. Given that both reactions can be legitimate in their own way, pricing is often perceived as a double-edged sword. The net effect of that perception is a reluctance to take the necessary steps to proactively manage price. Organizations end up kicking the proverbial can down the road when it comes to price management. This ends up leaving a lot of value – as much as 8 to 12% of operating profits – on the table as a result. But what if there was a way to turn price from a double-edged sword into an arrow in the collective organization’s quiver? The goal should be to proactively manage price and capture the value that leadership knows exists in the market and with customers. One of the keys to success is overcoming the obstacles that make price management harder for some parts of the organization. In our experience, combining a few starting analytics along with a better understanding of a company’s value proposition can give everyone in an organization the confidence to proactively manage price. A critical first step to managing price is isolating where price variances exist today so that the value at stake can be understood and effectively communicated by the organization. Analytics can help do that, and a common starting point is price band analysis (see Illustration #1). Using transactional data, companies can visualize the price points they are selling at and how much business flows through each. 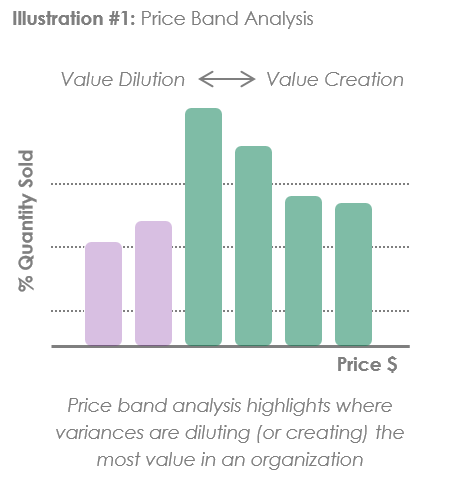 Price band analysis can quickly highlight where unnecessary or unexplainable price variances exist. Companies can evaluate price variances item-by-item or (if that is too complex) can cross-reference this analysis with a measure of the dollar impact of price variances. In either case, the goal of the exercise is to highlight specific products or services where the most value is at stake from pricing practices in order to (and this is key) focus opportunities to better manage price. Focus overcomes common perceptions that efforts to manage price will be arbitrary, “across the board”, or one-sided (e.g. only to inform price increases). However, price band and price variance analysis typically yield targeted price opportunities (e.g. for a specific division, product line, etc.). Yes, that’s right – improve customer conversations when discussing price. Clearly defining and articulating a company’s value proposition is a second step in getting everyone in an organization comfortable with price management and is the most effective way to rationalize price changes (up or down). Periodically performing customer interviews or surveys will commonly surface previously unearthed insights about customers’ expectations and perceptions of the price / value relationship that a company offers. That creates a foundation for understanding of how to position price and for changing how price is discussed in customer conversations. In an effort to set price based on value, price is composed of two parts: reference value and differential value (see Illustration #2). Reference value is the price of a customer’s “next best alternative,” which may be largely defined by the overall market. 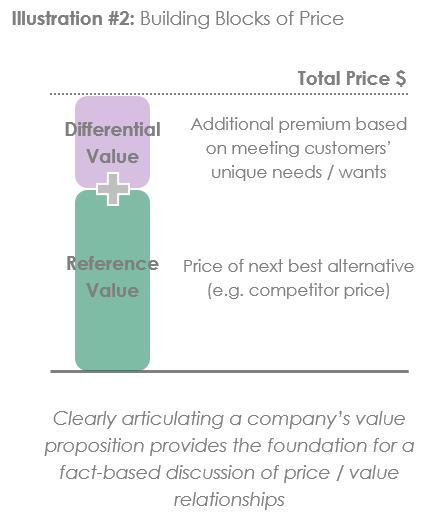 Differential value is the additional price an individual company can capture based on uniquely meeting the needs of a customer. Knowing what drives differential value (e.g. quality, service, lead time, value-added services, etc.) is rooted in the understanding of a company’s value proposition. If a company can clearly articulate the elements of its value proposition, projections of the dollar “value” delivered to customers can be estimated to justify price. In this way, a company is “selling on value” of the price point or change. Training the sales team on how to do this becomes extremely critical and is another key to success. Imagine sitting down with a customer and being able to justify price with an explanation of how value is delivered. Even if a customer disagrees with the going in assumptions, guess what happens? They may disagree and challenge those assumptions, but in doing so they are suddenly engaged in conversation about what they do actually value, which in turn provides an opportunity to better meet their needs. What organization (or salesperson specifically) doesn’t want to have that type of discussion with a customer? Seen this way, price management can again be viewed positively across an organization. So how is price viewed in your organization – is it a double-edged sword or an arrow in your quiver? Do you know where your current pricing practices are detracting from (or contributing to) your overall profitability? How well do you feel you understand what different customers value, including how price shapes their perceptions of what you deliver? A combination of price variance analysis and customer insights can help establish a fact base for using price management to deliver value to you and your customers. And this is an excellent way for everyone in your organization to get behind new ways to manage price.